An hour into Robert Altman’s Nashville, a shot opens with a cluttered wardrobe where statues of saints rest next to a candle, a hair dryer, a lava lamp, and a mirror. A zoom out reveals a bathrobe-clad woman in that mirror, singing and shimmying as she listens to the Grand Ole Opry on the radio. She’s Sueleen Gay (Gwen Welles), and she’s already been established as a waitress at an airport café with dreams of country-music stardom. She’s on the bottom of the film’s food chain, and her nasally drone of a singing voice means she’s unlikely to rise any higher. (“They gonna tear your heart out if you keep on!” insists coworker Wade (Robert DoQui). “They gonna walk on your soul, girl!”) Nevertheless, here’s the camera in her inner sanctum, listening to her sing during a quick break in the film’s 15-minute Opry setpiece. In a moment the soundtrack will be filled again with the voices of Haven Hamilton (Henry Gibson) or diva Connie White (Karen Black), the royalty of the film’s fictionalized country scene. But this slow zoom belongs to Sueleen Gay, starry-eyed wannabe. It’s a sliver of intimacy that shows where the film’s priorities lie. Nashville has a dizzying scope, compacting the exploits of two dozen characters across five days into 160 minutes. But it still allows time for soliloquies and murmured exchanges, because its breadth is backed up by formal density. Expanding on the styles of earlier works like M*A*S*H (1970) and The Long Goodbye (1973), Altman packed every frame of Nashville with audiovisual information. Consequently, multiple subplots often unfold within the same scene, right on top of one another. Even as Sueleen Gay serenades her mirror, for example, an ad for Goo Goo Cluster candies—a real-life Grand Ole Opry sponsor—remains audible in the background, audio that provides a segue back to the concert, where the product’s jingle is performed live. This is a bold and potentially obfuscating way to construct a movie, since it makes it impossible to catch everything that transpires onscreen in a single viewing. But it’s also crucial to film’s egalitarian drama, in which no single star predominates. In Nashville, the background is just as important as the foreground, and this diffusion of focus allows Altman and his collaborators to build a whole world out of minuscule interactions. As its bits and pieces accumulate, Nashville bustles like a Brueghel cityscape. The camera’s attention flits from one sector of the ensemble to another. Music-industry aristocrats like Haven and Connie congregate with their respective entourages at venues or at the Hamilton estate. Below them in the film’s hierarchy are hangers-on, journalists, and groupies, trying but failing to penetrate that elite circle. Some, like smug out-of-towner John Triplette (Michael Murphy), can roam where they like; he strikes bargain after bargain as he recruits talent for an upcoming political rally. Others, like the elderly Mr. Green (Keenan Wynn), get swept up with the rest of this mob only by proximity, since his wife is staying at the same hospital as ailing country superstar Barbara Jean (Ronee Blakley). As these characters navigate the shows and soirees that constitute a weekend in Nashville, their movements outline a teeming ecosystem of power and art. Each character veers along a pinballing arc toward a distant objective. The plotting interlaces these zigzags, introducing set-ups and pay-offs that can be separated by hours of screen time. In order to squeeze in this abundance of narrative, Altman relied on certain transitional strategies. Frequently, action is staged around musical numbers, with the singer’s voice lingering in the background while other characters hold side conversations nearby. When Haven performs his saccharine ballad “For The Sake Of The Children” at the Opry, he’s the center of attention, but plenty takes place in the margins: aspiring singer Albuquerque (Barbara Harris) tries to sneak past a security guard backstage; her husband prowls the audience looking for her; and Triplette mutters derisively about Haven’s height and outfit to lawyer Del Reese (a perpetually flushed Ned Beatty). As Haven launches into his next number, “Keep A-Goin,” a cut shifts the action to Barbara Jean’s hospital room—but his voice persists, now staticky and diminutive on the radio. The film’s innovative multi-track sound enables these spatial jumps even as the songs play in full. Similar transitions take place during phone calls, with the voice on the speaker still there, if barely audible, as the action bounces between locations. The point isn’t necessarily that every word be heard; it’s that the conversations are happening at all. They’re decipherable from context, linking multiple lines of action. These phone calls are like the vans that crisscross the city, blasting monologues spoken by Triplette’s unseen candidate, Hal Phillip Walker: They glue sequences together through sound. When a scene stays within a single location, sound cues tend to be supplemented by a favored visual tactic: pans across rooms that turn into zooms, drawing a new character deeper into the heart of the frame. These techniques juggle the film’s massive ensemble. They make it possible for Nashville to replicate the confusion and chance encounters of real life without degenerating into actual chaos. Throughout, the film balances its tightly structured storytelling with forays into documentary. Real Nashville locations, audiences, and musicians become elements of its fictional world. One exterior shot pans quickly from left to right as the Tricycle Man (Jeff Goldblum), an eccentric biker, rides into town. Only through close examination does it grow apparent that the road is dotted with posters for the Walker campaign. The landscape has been colonized by the movie. The scrupulous naturalism of these surroundings helps the film’s frequent coincidences and parallelism seem less schematic. Even though Sueleen Gay and Albuquerque’s experiences run side by side—hunting for gigs in the same dive bar, their paths eventually converging with Barbara Jean’s—it’s plausible when it’s set in such a thoroughly developed semi-fictional city. It’s especially realistic because the two women never even interact. All of this is conveyed strictly through implication. Little in Nashville is stated explicitly. Characters’ personalities are expanded on through the visual shorthand of costume and production design. Clueless reporter Opal (Geraldine Chaplin) wears a hat bedecked with a musical note, a signifier of tourist status just like the jacket worn by troubled drifter Kenny (David Hayward), which has “Columbus, Ohio” emblazoned on the back. L.A. Joan (Shelley Duvall), another outsider, changes into increasingly outrageous wigs over the course of the film; they mark her as more fashionably protean than the Tennesseans around her. Haven Hamilton’s colossal ego is made manifest in a set of flower arrangements he sends to Barbara Jean, each of them shaped as an “HH” ringed by a horseshoe, and philandering folk singer Tom (Keith Carradine) wakes up to the sound of his own beautiful voice on a record—an audio correlative of his selfishness. Like the decorations on Sueleen Gay’s wardrobe, these details allow a peek into each character’s psyche by way of self-presentation while making economical use of each actor’s time onscreen. By itself, each one of these decisions is inessential and easy to miss. But together, they contribute to Nashville’s internal consistency. They’re flourishes that make the movie more complete. These scattered props and garments are like the lyrics to Barbara Jean’s songs, which likewise add emotional dimension to her story. Like many members of the film’s cast, Ronee Blakley (herself a trained musician) wrote the material she performed. Her songs speak poignantly of personal history: “My daddy grew up on his own, more or less,” she sings in “My Idaho Home,” whose title refers to the actress’s own home state. “His mama died when he was just 11.” This is no disposable window dressing; instead, it’s a song so resilient that Blakley incorporated it into her repertoire and still performs it decades later. She penned a song that, like many of Nashville’s grace notes, lays bare her character’s vulnerabilities as it readies the audience for the heartbreaking climax to come. The words to that song inform the rest of the film, their nostalgia rippling back through earlier events. As with every little piece of Nashville, the micro filters into the macro. The aggregation of dialogue, décor, and camera movement determines the overall texture. They’re the bumps and grooves in its grain. That surface is pocked with the disparate longings of the film’s many players. Sueleen Gay’s quixotic yen for stardom gets its very own patch of onscreen space, as do Barbara Jean’s vexations with the burdens of fame. They coexist, sometimes in the same shot, with other characters’ more ignoble tendencies, like Triplette’s politicking and Tom’s womanizing. Together, they form a rich, capacious panorama of American discontent going into its country’s 200th year, its canvas broad but its attention still doled out to even the smallest of gestures. 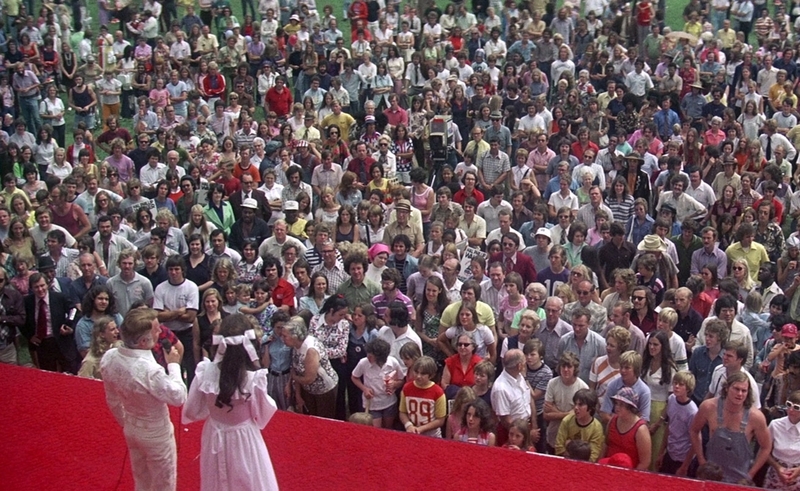 In Altman’s Nashville, tragedies come in a multitude of shapes and sizes, and all of them are scored to country music. Y’all come on back on Thursday, when Keith Phipps and Genevieve Koski continue the Nashville discussion in the Forum discussion, and Charles Bramesco dives into the film’s memorable music in an accompanying essay.